In the end, AzhwAr says “Those who recite/practice this decad with their heart’s involvement, will not suffer in separation from emperumAn that I suffered”. Subsequently, AzhwAr mercifully explains the fruits of this decad saying “Those who recite this decad being emotionally charged with love will be free from the sorrow of separation from bhagavAn“. ilargaL – will be devoid of. nammAzhwAr, the faultless leader of distinguished AzhwArthirunagari, who has no faults and who is performing anjali and dancing up and down, towards krishNa who is having divine complexion resembling a radiant blue jewel, doing all of these as kainkaryam (service) to cure the disease in the form of sorrow of separation from emperumAn. Such nammAzhwAr explains the ways to eliminate the worshiping of other dhEvathAs in this decad among these thousand pAsurams revealing without missing any aspect of bhagavath svarUrpam etc. Those who are experts in such decad who can pray, dance and sing this decad will attain the character of being free from sorrow born out of separation from emperumAn and sorrow caused by pursuing other dhEvathAs. thozhudhu Adith thUmaNi vaNNanukku Atcheydhu nOy thIrndha – For this, ammangi ammAL [a disciple of bhagavadh rAmAnuja] explains – When an unconscious person regains consciousness slightly, others will say “she drank curd, stabilized herself, opened her eyes and spoke a few words”; similarly, here also done [that parAnkuSa nAyaki prayed, danced, sang etc]. Due to the previously experienced great grief, even the awakening is rejoiced greatly; since next decad is “seelamillAch chiRiyEn” (very humble person with no good qualities), she only regained as much consciousness as required to be called out. thozhudhu … – even this friend of parAnkuSa nAyaki does not understand bhagavAn‘s greatness; she told others to praise emperumAn; but for parAnkuSa nAyaki to be awakened even that is not required and just her telling others to praise him is sufficient. Just as outsiders will not understand bhagavAn’s greatness, even those who are insiders find it difficult to comprehend his greatness. 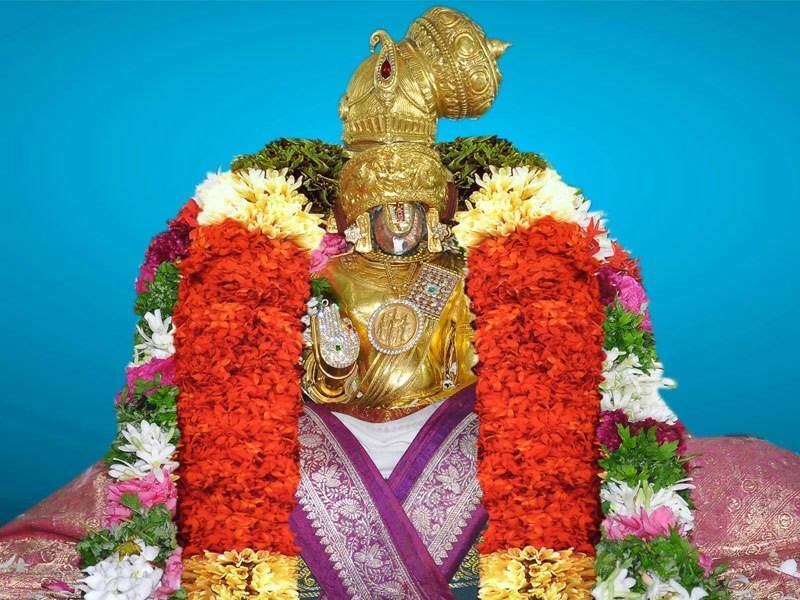 vazhuvAdha thol pugazh – Even in unconscious/bewildered state, dhEvathAnthara sparSam (contact with other dhEvathAs) and thadhIya sparSam (contact with the devotees of other dhEvathAs) lead to destruction of one’s existence and even in such state, bhagavAn‘s names and thadhIya sparSam (contact with devotees of bhagavAn) lead to sustaining oneself – greatness of being situated in such SrIvaishNavaSrI. This is what makes one a vaishNava; after hearing the instruction “sarvESvaran is rakshaka (protector)” [based on dhvayam or charama SlOkam] from some one (i.e., AchArya), if one comes in contact with other dhEvathAs and abhAgavathas (non-devotees), one cannot be called as vaishNava. If one meditates upon the first half of dhvayam, one cannot engage in any self-effort [even cutting grass]; if one meditates upon the second half of dhvayam, one cannot even sleep for a moment like iLaiya perumAL [lakshmaNa who accompanied SrI rAma and served him]. One’s state would be as explained in thiruviruththam 97 “kazhivadhOr kAdhal uRRArkkum uNdO kaNgaL thunjudhal” (For one who is very attached to emperumAn, can he/she even sleep for a moment?”. When one realizes “this is the svarUpam (true nature)”, if the activities befitting that svarUpam are not pursued and if the obstacles for such activities are not avoided, it implies that true knowledge has not dawned in that person. If one does not follow this fully, he cannot be said to be following the path of AzhwArs; AzhwArs’ nature is explained in nAnmugan thiruvanthAdhi 68 “thiruvadi than nAmam maRandhum puRam thozhA mAndhar” (A SrIvaishNava may even forget emperumAn’s name, but will never worship other dhEvathAs), nAnmugan thiruvanthAdhi 53 “thiruvillAth thEvaraith thEREnmin dhEvu” (I will not consider a dhEvathA who is without SrI mahAlakshmi as dhEvathA), periya thirumozhi 11.6.7 “eNNAdha mAnidaththai eNNAdha pOdhellAm iniyavARu” (It is pleasing whenever I don’t think about those who don’t think about emperumAn), periya thirumozhi 7.4.4 “pErALan pErOdhum periyOrai orukAlum pirigilEn” (I will never separate from those great personalities who recite the names of the great lord). Should one at least not do this, being grateful to be freed from sins which were carried out since time immemorial and to attain eternal kainkaryam? vazhuvAdha AyiraththuL … – This decad which explains all the principles that are to be known by the AthmA, without missing any aspect and which relate to veRi (removing the attachment towards other dhEvathAs]. In thamizh culture, there is a tradition named “veRi vilakku“; when a girl is suffering from viraha jvaram (fever of separation from her beloved), the relatives would start engaging a psychic reader in cutting goat, offering alcohol and sacrifices, and a friend of the girl would say “This is a disease which occurred due to attachment with her beloved and not because of anything else” and stop their activities. thozhudhu Adip pAda vallAr – As the relatives would feel rejoice on having the bewilderment of the girl eliminated, the same joy would be present for those who learn this decad – that is how AzhwAr feels. dhukka seelam ilargaLE – The sorrow is – coming in contact with other dhEvathAs and losing contact with bhAgavathas, when being bewildered. They will acquire the character of not having such sorrow. seelam – svabhAvam (character). This entry was posted in thiruvAimozhi, thiruvAimozhi 4th centum on March 12, 2017 by Sarathy Thothathri.